Today’s stage leaves from Rotterdam… but first; I didn’t used to be a fan – but I guess that was just because he was one of the few who could beat my idol, Super Mario – but now I’m a confirmed Ale Jet admirer. Depending on which reference site you chose he’s had 156 – or is it 169 wins? He’s 36, born 03:01:1974 in La Spezia. He turned pro in 1996 but didn’t score a win until ’98 in Langkawi. He’s won Milan-Sanremo, Paris-Tours, the Scheldeprijs and has made the Costa Etruschi his own. In stage races he’s won in the Vuelta, the Giro, Langkawi, Luxembourg, Regio, Route du Sud, Provincia di Lucca, Coppi Bartali, Settimana Lombardi, Poland, the Med, Valencia, Paris-Nice, Holland, Aragon, Tirreno, Britain, Turkey, Romandie, Ruta del Sol, Algarve, Reggio Calabria – and le Tour. His best year was 2003 with 30 wins, including six Giro stages, five Vuelta stages and four Tour stages. Ale Pettachi in his familiar winner’s pose. In 2004 he won 23 races – nine of them stages in the Giro. Last year at the Giro he looked super cool; this year he looks leaner, craggier – fitter, in fact. Disregard Ale at your peril – and it would be remiss to ignore him for Melbourne. I still think he was lucky not to get declassed after turning left in the finishing straight – but the commisaires had other things on their mind. If it was a good day for Lampre, the Bad Fairies continued their work on Cav – and his team. Adam Hansen is a sound guy, he always has time for you, he gives good – often humorous – answers and is a pleasure to deal with. It’s very sad that he’s out, especially bearing in mind that he’s in great form – fresh for winning the Ster Elektrotoer. Cav – the word is that he partied too much over the winter, the dental problems didn’t help and his luck this season has been dire. But like Nietzsche said; “that which does not destroy us makes us stronger” – he’ll be back. Cav gets a talking to from Erik. Photo©PAPhoto. He looked more embarrassed than anything else after he’d taken out Jez and Oscar Freire – but that’s bike racing. Apart from the dog incident and the mad finalé, it was a pretty tranquil first stage and they had plenty of time to chat to folks on Eurosport; including Scott Sunderland – he wasn’t giving much away about his next move, but we’ll be surprised if it doesn’t involve a certain Grande Duchy. David Millar continues to impress, he’s obviously enjoying his racing and is a key member of Tyler’s train. Tyler winning St.11 of last year’s Vuelta. We reckon we’ll see him doing the same thing in the next few weeks. The man from Washington State with the squarest shoulders in the business was another speedster who didn’t enjoy stage one – no ‘dream’ Fourth of July wins for the USA. Today’s papers illustrate clearly the difference between the Tour and all other bike races – full pages in the Guardian and Times; after Brad lost the jersey in the Giro it might as well not have been on, as far as the Guardian was concerned. 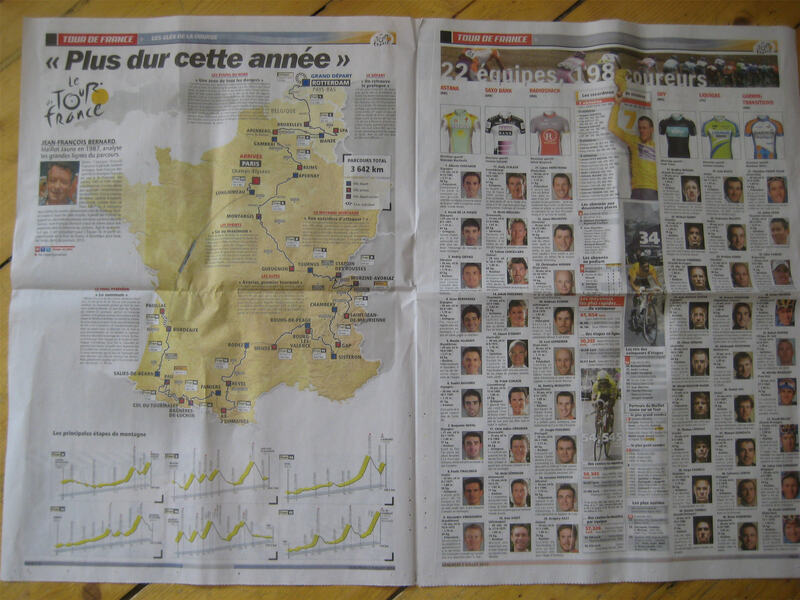 We tracked down L’Equipe to the International Newsagent on the High Street; albeit’s Friday’s edition – tomorrow it could be the prologue, or it could be stage one? The race coverage in l’Equipe is second to none. Their Tour guide is cool, a picture of every rider and mega stats – we’ll bore you with them tomorrow. It’s a “Mini Liege-Bastogne-Liege” tomorrow – there should be lots to talk about. Next articleLe Tour de France 2010, Stage 2: Brussels – Spa; Tour Feminine?